I was given an ARC in exchange of an honest review. In death, Didi Storm is finally getting the kind of publicity that eluded her in life. Twenty years ago, the ex-beauty queen worked the Vegas strip as a celebrity impersonator, too busy trying to make it big to spare much time for her daughter, Remmi. Shortly before she leaped from a San Francisco building, Didi’s profile was rising again, thanks to a tell-all book. To Detective Dani Settler, it looks like a straightforward suicide, or perhaps a promotional stunt gone wrong. But Remmi knows the truth isn’t so simple. Because though the broken body on the sidewalk is dressed in Didi’s clothes and wig, it isn’t Didi. half-sibling. Remmi has pleaded with the authorities to find them, but there have been no clues. Yet she’s always had the sense that someone is watching her . . . If the victim isn’t Didi, who is it—and what’s the connection? Remmi is shocked when Noah resurfaces. He was also in the desert that night, and now runs his own PI firm. He too believes it’s time to find out what really happened. As they and Detective Settler dig deeper, the truth about Remmi’s missing family begins to emerge . . . a story of ruthless ambition and twisted lies that someone will kill again and again to keep hidden . . . 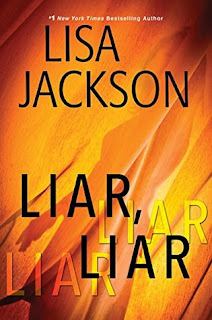 This is my second book by Lisa Jackson and I must say, I don´t know if I´ll read another one. As the first book I read by this author it =had great potential, it could have been a great book, but it was really boring with so many point of views. The story just didn´t evolved. I felt like I was reading the same part over and over, and was really annoying. Which reminded me that I just read a book with a lot of poitn of views like this one, but it well written and didn´t gave the same feeling. So, I´m sorry but I can´t say I liked this book. Este é o meu segundo livro da Lisa Jackson e devo dizer que eu não sei se lerei outro. Como o primeiro livro que eu li desta autora, este tinha um grande potencial, e poderia ter sido um ótimo livro, mas ficou muito chato com tantos pontos de vista. A história simplesmente não evoluiu. Eu sentia como se estivesse lendo a mesma parte várias vezes, e era realmente irritante. O que me lembrou que eu acabei de ler um livro com muitos pontos de vista como este, mas que não me deu o mesmo sentimento, pois a história se desenvolveu bem. Então, sinto muito, mas não posso dizer que gostei deste livro.